The day was June 19, 1986. I was fresh out of junior high school at the age of 13, looking forward to my high school years and home chillin' watching TV on a warm day. Having been a true Celtics fan from my early elementary school years, I was still gloating over Boston's selection of Len Bias. All of friends were mad. They hated the Celtics. They hated the fact that I liked the Celtics. All they wanted to do was criticize the city of Boston for being racist. But as a kid, I didn't see much of that. I saw how good that team was on the court. I saw the 'Tiny' Archibald jersey in my closet that my Dad had bought for me when I went to the Boston Garden one winter to visit my grandparents, who lived in Roxbury. I had tons of Celtics memorabilia all over my bedroom and I was tremendously excited to know that Leapin' Lenny Bias was gonna be on my squad. So as I sat in the living room, Channel 7 interrupted the program I was watching with a breaking news story. 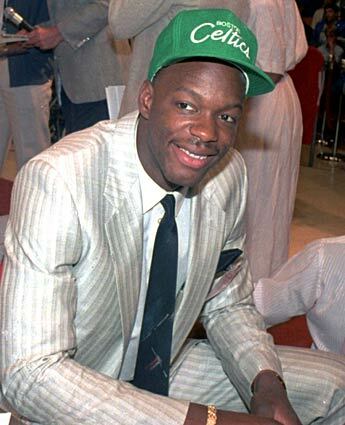 The reporter on the scene announced that Len Bias has suffered cardiac arrest and been pronounced dead at Leland Memorial Hospital earlier that morning. Say what? Huh? Are you kidding? This has got to be some kind of joke. I sat there stunned. I couldn't move. I was in utter disbelief. No way Jose. My first thought was to ride my bicycle down to Leland Hospital because we didn't live too far away, maybe 2 miles or so. I didn't know what to do. I picked up the phone and dialed my Dad who was living in Charlotte, NC at the time. I told him what the news had just reported and he was just as shocked as I was. We talked for a minute and then we got off the phone. I sat there and cried. Why had Lenny died? He was not only my favorite player in college basketball, but he was going to be playing for my favorite team. This wasn't right. He couldn't be dead could he. The news reporters must have had the wrong guy. Maybe they made a mistake. 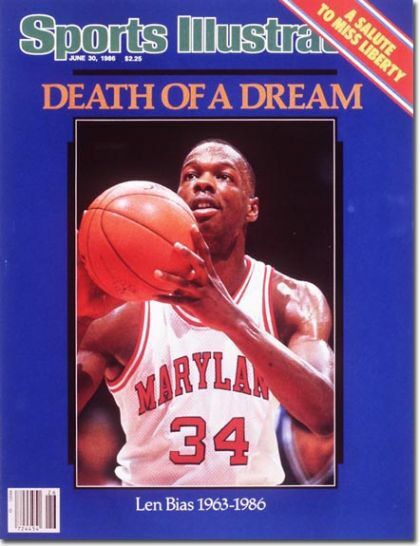 Sadly, over the course of that day and the subsequent days following, I learned the truth about the death of Len Bias. I learned about cocaine and what it can do to your body. I couldn't understand wht he would do such a thing. He was the greatest athletic phenomenon I had ever seen on a basketball court. Why the drugs Len? Why the drugs? I was left with nothing but memories of games I had attended at Cole Field House. Gone were my dreams of going to Capital Centre to see the Celtics play the Bullets and watching Lenny dunking on those bums. Gone were my dreams of a winter visit to see my grandparents and seeing the Lenny with the Celtics in the Garden. All I had left were the visions of him doing a tomahawk jam on the Tarheels or one of those classic baseline moves punctuated with a reverse slam. 20 years later I still shake my head when the topic of Len Bias comes up. What might've been is always the topic of conversation. I still say that he would've been better than Michael Jordan, but of course that's something we'll never know. I purchased the Sports Illustrated issue following his death and it remains in a sealed plastic bag. I pull it out every few years and flip through it. It just doesn't seem real at times. I can't stop shaking my head. Even more disturbing at times was the fact that I attended Northwestern High School with Len's younger brother Jay Bias. I was a sophomore the year he was a senior, but I still remember Jay being a very talented ball player and I even went to a handful of Wildcat basketball games that season. On occasion, he even rode my bus because there were a couple of guys he was cool with that lived around my way. It wasn't like we were boys or nothin' but I'd always say wassup or give him a head nod when he passed by. Sadly, he died tragically as well after being shot twice in the back on December 5, 1990. Once again, Leland Hospital was the location where the pronouncement of death was made. This was a cruel joke or it sure as hell seemed like one. I remember getting the call about Jay's death when I was stationed in Connecticut while in the Navy. I just dropped the phone in shock again. I'll never forget any of those moments that I saw Len Bias play, whether live at Cole or on TV. Those were some of the best basketball games that I've ever seen. Being a huge Lenny fan and a Celtics fan I went and had a jersey custom made sometime back in the late 90's. This was well before the whole throwback craze began, but folks swear that it was done to follow a trend. I don't care anyway, it was kind of my way of honoring one of the best ballers that I had ever seen on the hardwood. It was my tribute to a guy who made the lil' kid jump up and down in the stands and holler and scream to no end. R.I.P. 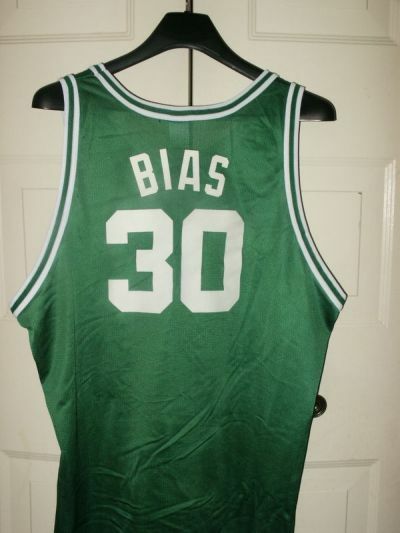 Len Bias. I never knew you, but I sure as hell feel like I did. Man, this entry was really heartfelt. I felt a lot of those same emotions, and I remember heraing about his brother's death. He mom actually came down to Fredericksburg, VA to talk to our church about how she lost both of her sons at a very young age due to their involvement with drugs(although under different circumstances). Thanks for linking to this on my blog. I definitely plan to check out all of the different highlights and articles.